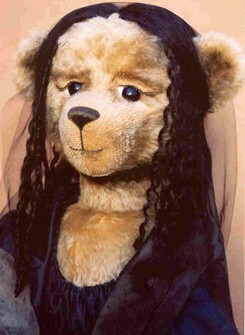 Mona Lisa - 'Bearly' a smile! 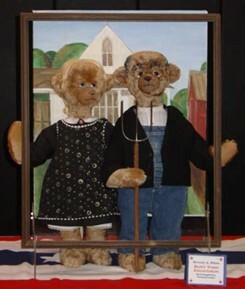 Bev White, wife, mother of five, grandmother of 13, nurse, and maker of teddy bears has resided for the past 30 years on four wooded acres just outside of Philadelphia, Pennsylvania. There, she became inspired to put her nursing profession in the background and begin her business which she calls, Happy Tymes Collectibles. Her craft has developed from its origins of making wood dolls depicting the illustrations from her favorite childhood books. Using her sewing skills that she taught herself when she was 15, Bev continued honing those skills through making her children's dolls and household items. 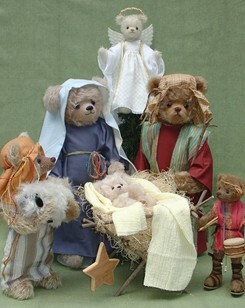 She created nursery rhyme characters and historical figures from beads, clothespins and fabric. After creating Goldilocks and her three bears, in which she used wool fabric over the head bead, she found that she enjoyed embroidering the little faces as much as painting the doll faces. 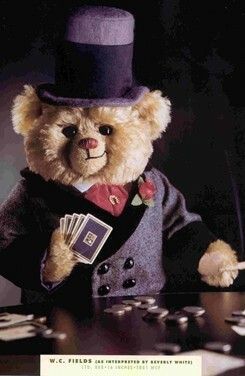 "One day, someone gave me my first Teddy Bear Review magazine. 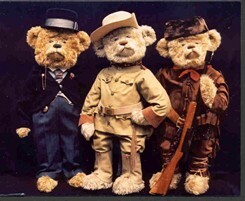 Imagine that, a magazine dedicated to just Teddies." 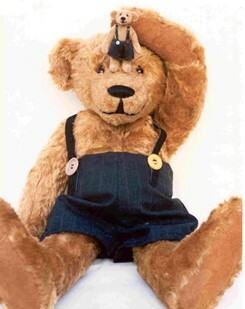 Bev soon found herself clipping out the magazines' pattern for a jointed bear and began to experiment from that moment with her own patterns and eventually moved to using mohair fabric. 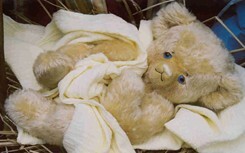 Two of her first original patterns were her Prayer Bear and her Mr. Brewster Button Bear. 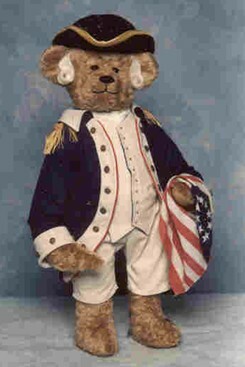 Brewster became her signature bear and over the years, she made 150 of him. A miniature manufactured edition of 1000, celebrating her 10th anniversary, sold out quickly. Lacking any formal art school background, she drew on knowledge that she had gained from classes she took on figure drawing and portraiture following her graduation from nursing school. 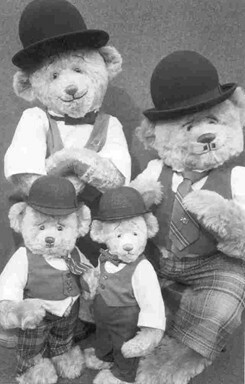 "I believe that my Portrait Bears, which have given me my niche in the teddy bear world, came from the enjoyment and inspiration of those fundamental classes so many years later." However, her nursing experience, along with the learned people skills and hand skills including the surgical ladder stitch with a curved needle, are still very evident and useful in her personal and business life today. Inspiration for creating a bear can come from anywhere; at anytime. Sometimes a conversation, a name, a dream or a picture provides an unexpected "idea attack." "That's how my Portrait Bears started in 1992. 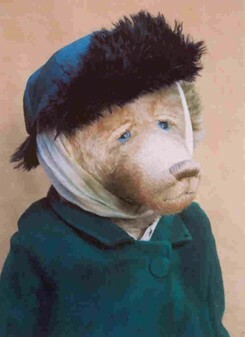 I had this idea to try to make a bear that would look like a recognizable human," she recalled, "So when I walked into our local video store and came face to face with a poster of Laurel and Hardy it all crystallized for me. I talked the shop keeper out of the poster, took it to my studio to absorb for a few weeks and then set about making the patterns. It worked the first time. They were a resounding success, not only personally, but they garnered a very high auction price at Disneyland's first convention, won three TOBY awards in 1993 and set me on a path to the future. Next up was W.C. Fields, just to prove that I could do it again!" Bev's bears have always been recognizable by her hallmark stitch that just skims over the eye of almost every bear she's made. "It gives them a worried look, fitting I think, and is a carry over from the painted faces of my nursery rhyme dolls." "Once I had the need to create the distinctive heavy eyelids for the Laurel character, I used them on other bears and then the eyelids also became a common trademark that gives recognition to my work and all my Portrait Bears really need them." In the years leading up to 2000, she created numerous designs which were then reproduced for the Franklin Mint, Cooperstown Bears, several others, plus manufactured lines for herself. "I thoroughly enjoy museum commissions for special dynamic work and found that the Disney events were a wonderful challenge and a new direction in licensed character bears." "Originally my intent was to provide an easy "Bear making 101" experience in a simple, self-contained kit that would reach folks, young and old, beyond the collectibles world. I think I can call it a success. "Whether at a Girl Scout event, a birthday party, a picnic, a festival or a hospital, the joy of sharing a fuzzy hug goes way beyond the boundaries of marketing and merchandise." "Next month I return again to my favorite place, Children's Hospital in Philly for the annual fun-day party. It is such a joy to share the smiles and tears." In recent years, her love for portraiture and art has rekindled a dormant interest in painting. Bev began incorporating the two interests just to see if could be done, respectfully. 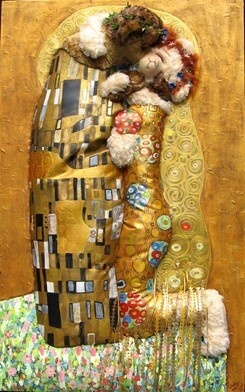 This marriage of interests has resulted in a number of three dimensional, or high relief "Bear Parodies" of famous artwork. 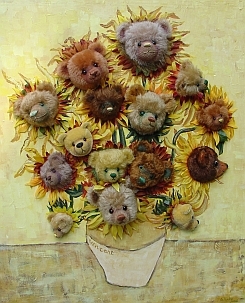 Quickly recognized, even with bears as the subject, these paint and fiber creations are, in Bev's words, "a struggle but so very rewarding to accomplish." Currently they include Michelangelo’s Creation and Mona Lisa along with Van Gogh’s Self Portrait created in 2001, Wood’s American Gothic and Van Gogh’s Sunflowers made in 2005, Klimt’s Kiss in 2007 and Munch’s The Scream in 2008. "So many faces, so little time!" Beyond the awards, magazine covers or articles and appearances, there is a greater reason for doing what she does because it has never been a financial necessity for her. "I make teddy bears because I love to. I enjoy, beyond words, being able to create something that evokes emotion and soothes the soul. It satisfies the artist in me, the nurse in me and the independent person in me. It reaches out to everyone; family, friends, collectors and folks I don’t even know. It says who I am, what I think, and how I feel through a three-dimensional, fuzzy, huggable form; simply called…a teddy bear." Growing in Bev's own back yard are Sunflowers with bear faces! 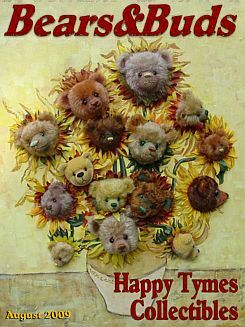 Bev's version of Van Gogh’s Sunflowers made a perfect front cover for Bears&Buds Teddy Bear Magazine too.